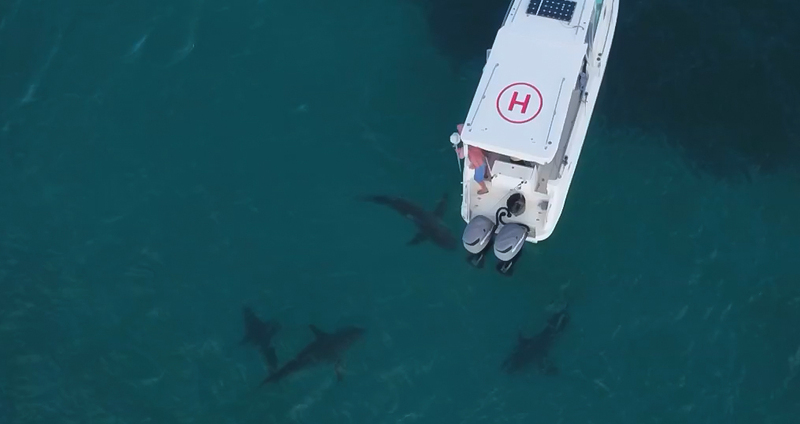 Let’s delve into one of the more challenging and rewarding aspects of aerial video production… filming off boats over the water. “Holdfast” built by Dongara Marine punching out. 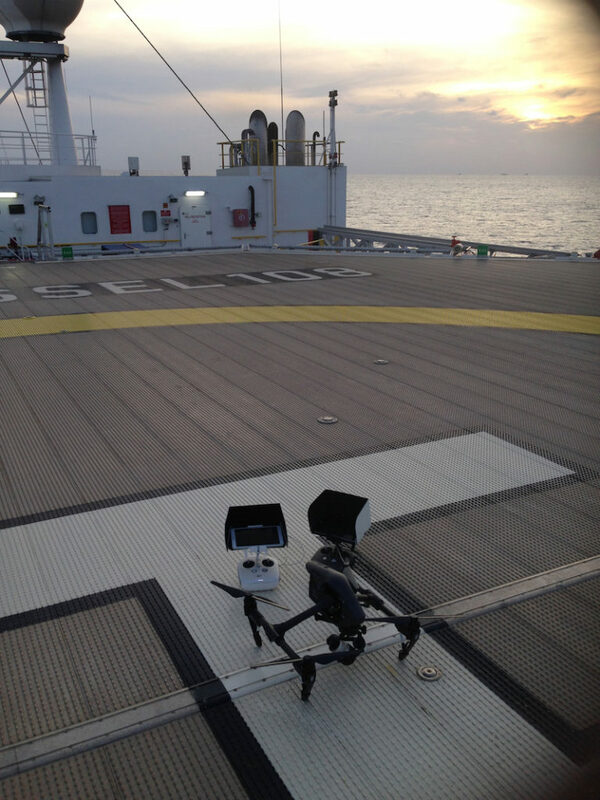 Flying and filming from boats… it’s not for the faint of heart, or those prone to sea sickness! There is something about standing on one moving object (and not being able to see the waves coming) while keeping your sight fixed on another moving object (the drone) that can make you go green in the face very quickly. Of course the bigger the boat the better. Taking off from said moving platform can also be challenging, landing…. now that can be down right freaky. Again… the bigger the boat the better. 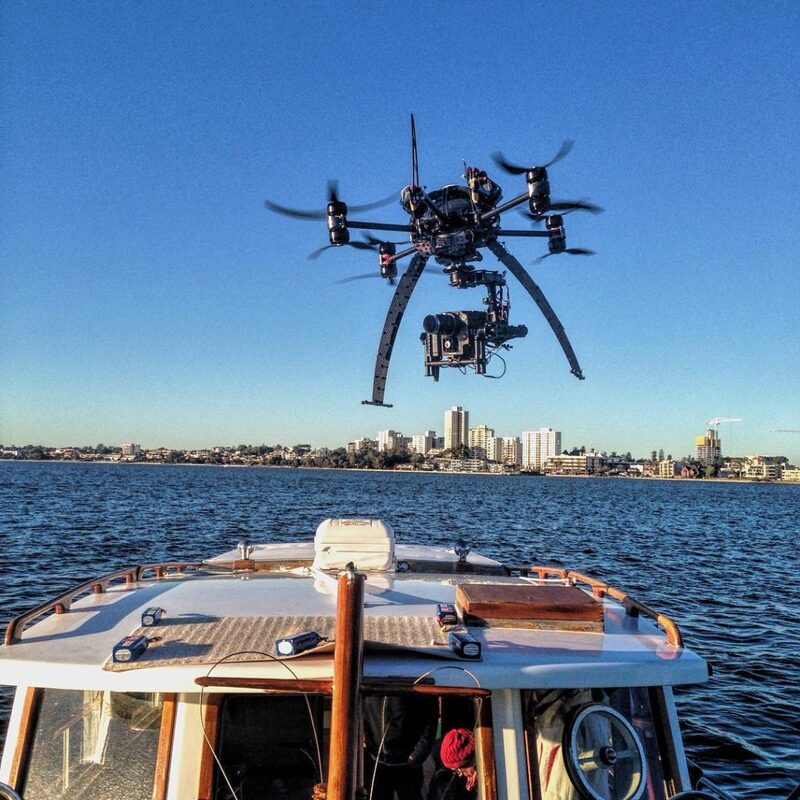 If it’s really rough or the boat is very small there is the option of a hand grab landing (count your fingers after), which is fine for the smaller drones (Inspire 2 with Zenmuse X5s or X7), but when we’re flying our big drones with a RED Monster / Gemini or Arri Alexa Mini Camera and an anamorphic lens totalling about 25kg… it’s not an option. 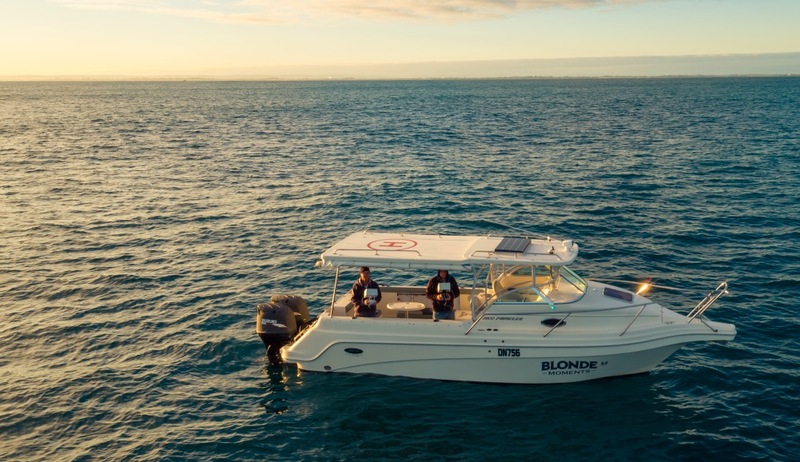 We have our own boat that we use to film from, complete with drone helipad on the roof, but from experience it’s just as easy to take off and land from the vessel you are wanting to film. It’s easy to coordinate the shots and boat movements with skipper which speeds up the process greatly. “Blonde Moments” our floating work platform. There are some interesting technical issues with flying off boats, one of those is the “return to home” function. This is a safety feature, if reception drops out or the batteries get too low the drone will automatically return to the place it took off from and land. So of course with taking off from a boat it’s never going to be in that exact some spot…. it’s always good to turn off this function before lift off. Allowing for the wind is another consideration, it’s not good to fly away with the wind then when you return the drone is struggling into the breeze and you’re watching the battery power dropping fast. It’s always good to start up wind first if possible. 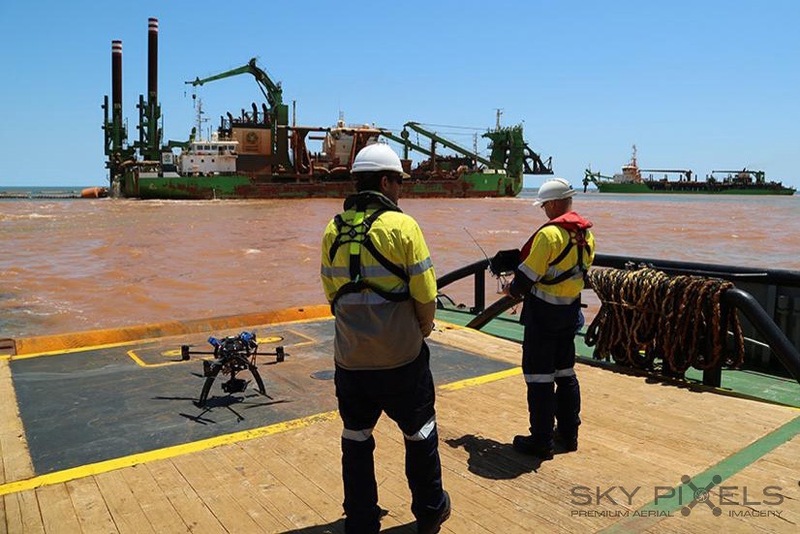 Big steel boats can also effect the drones compass and navigation abilities which needs to be taken into consideration as well. Salt and electronics don’t like each other so working off boats means constantly checking the lenses for salt spray after every shot and also giving all the gear and good clean at the end of each day. If the shoot is going to be a long one you need somewhere to recharge batteries. Bigger vessels usually have 240 volt power but small boats don’t so we make sure we have enough batteries. They said the boat was going to be bigger! The Ultimate in offshore landing decks. 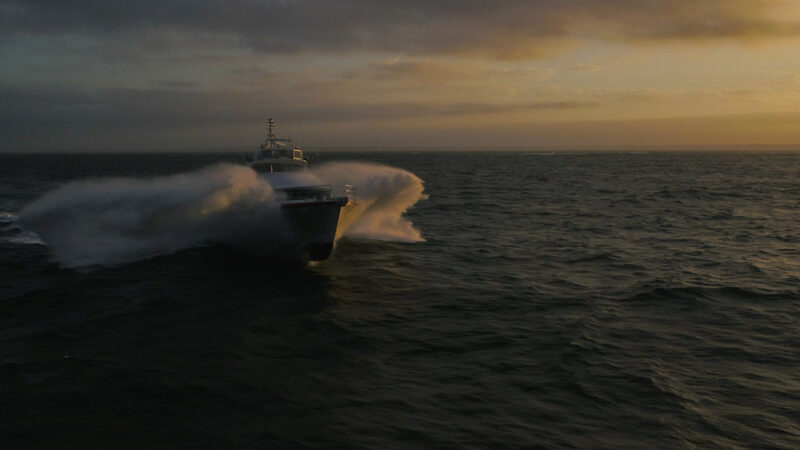 We can get a lot of amazing results and we can create a lot of interesting footage in a short amount of time filming from boats. If you’re interested in learning more about what we can do for you drop us a line, we’re always open to discussing innovative ways in which to help you achieve spectacular images.